DUE TO RAIN, THE RALLY HAS BEEN POSTPONED UNTIL THURSDAY AUGUST 23 FROM 6-10 PM AT PULLMAN SQUARE. Marshall University and Kindred Communications’ 93.7 the DAWG, flagship station of the Thundering Herd IMG Sports Network, are coming together again to host a special night of the Summer Concert Series and kick off football season Thursday, Aug. 16, from 6 until 10 p.m. at Pullman Square in downtown Huntington. In addition to the vendors and activities that have taken place each week of the concert series, this event will include a fashion show, photo booth, inflatables, the Marching Thunder, Marco and Marshall University Athletics. The first hour will include a fashion show featuring Marshall’s new licensed gear. The show will give fans the opportunity to view some of the new fall apparel available at various local retail locations. Marshall University’s School of Art and Design students will host an art activity for visitors and the Visual Art Center will be open until 8 p.m. for guests to visit the 2018 Biennial Faculty Exhibition in the Carroll Gallery. During the 7 p.m. hour Aug. 16, Marshall Athletics will be hosting Compete on the Street. Visitors will have a chance to participate in activities with players from the women’s basketball and volleyball teams. 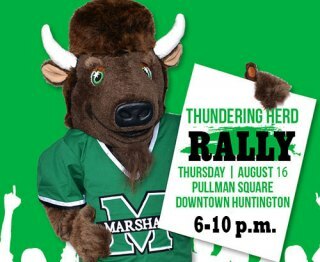 An hour-long pep rally will begin at 8 p.m. featuring the Marching Thunder, cheerleaders, dance team, Marco, and Marshall University coaches and athletes, including Head Football Coach Doc Holliday and his players. The Marching Thunder, cheerleaders and dance team plan to energize the crowd with a few fan favorites and a taste of what fans can look forward to seeing and hearing in the stadium this season. Marshall student-athletes will also be available to sign autographs and take photos with fans. Guests will also have the opportunity to register to win prizes during the event, including gift cards from retailers participating in the fashion show and Thundering Herd football tickets. Winners will be announced during the pep rally. Fans must be present to win.